where can I get the mirror? I love the mirror…where did you get it? I've seen mirrors very similar to that one at Homegoods. What brand/size is that mirror and where can i buy it? You can have your local mirror/framing company create similar in any size you need in any frame profile/finish you like. What is the height of this mirror? Shallow cabinet - Can you please tell me where you found a shallow cabinet? I have a laundry shoot on the wall and would need something similar to this to give me storage rather than the vanity I currently have in a similar space. Thanks! Cabinet Hardware - I love the cabinet hardware! Do you have the brand and/or style information? What company made the window? Would love to know what you used in shower. 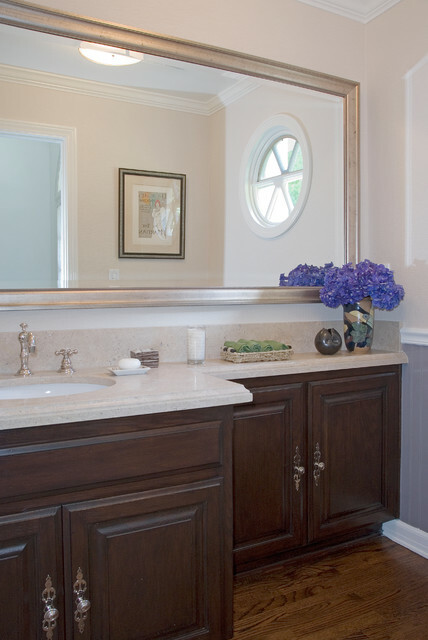 Would you mind sharing the material and color of vanity top? Thank you! Kingston Brass Heritage 2-Handle Widespread Lavatory Faucet, 8" To 16"